The Seven of Hearts may have felt just a little jealous the other day when the Six of Hearts presented his story at the Sevens and Under Public House. But he soon had a tale of his own. The Seven of Hearts called all his comrades at the Sevens and Under Public House to attention as he began a story just a night after the Six of Hearts had entertained the clientele with his own tale. “I can see that a diamond lead and club shift will doom the contract,” the feisty Five of Diamonds said. 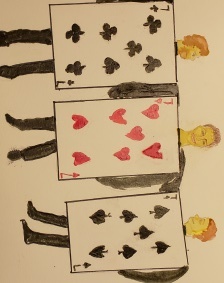 “Wonderful, I was involved in this story, too,” the Four of Hearts said. “Glad to be of service,” the friendly Six of Hearts said. “Good going, brave Seven of Hearts,” someone yelled and soon all of the sevens and unders were cheering that evening’s hero. This entry was posted in bridge friends, Bridge Hands, Bridge Humor, Bridge Rivalries, Fiction, Humor, Stories, Uncategorized and tagged Bridge, bridge buffs, Bridge Club, Bridge humor, bridge rivalry, duplicate Bridge, Seven of Hearts, Sevens and Under Public House, The Seven of Hearts Has His Day. Bookmark the permalink.